There is something so special about boutique shopping. Social Jane has always been a place I could find the hot new trends. I couldn't wait to pick out a few for the Blog. The first one is the Tie front top. This mustard color is one of the hottest colors for spring and if you can't wear mustard it also comes in White. I paired it with the textured wide-leg cropped pants. This look worked so well with these adorable ankle booties.Such a comfortable outfit that would look great on any body type. I would also wear the top un-tied with skinny jeans or leggings. Ya'll know I have really been crushing on camo so this little camo tank dress was just perfect. It's fun to pair the camo with a floral print. This Kimono has got such a different color scheme. It is trimmed in white pom poms. I think would be stunning with a white tank and white jean to change it up. Graphic T's are fun and they let us show a little personality. Be bolder not older!!! The Dear John Denim long shorts are the perfect alternative to cut-offs. This hat just added to the fun of the graphic t. When you step out with a trend why not take it all the way. This last look is just so elegant... The snakeskin blouse is very pretty. 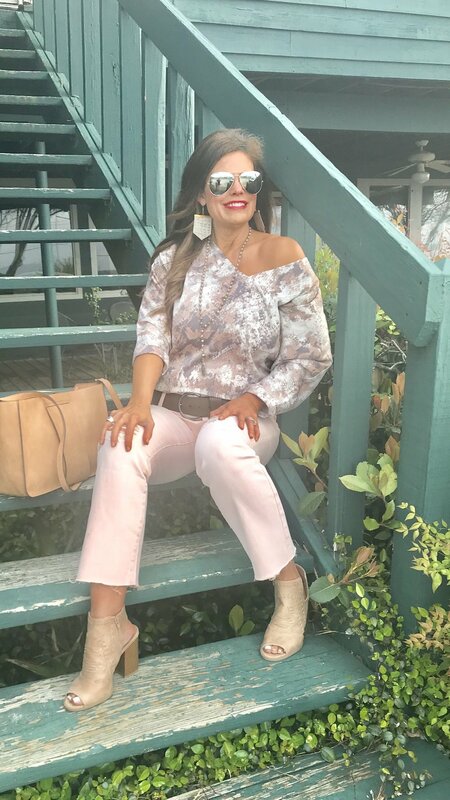 I love the color of these pale pink flare cropped jeans. They are Dear John also and have such a flattering fit. 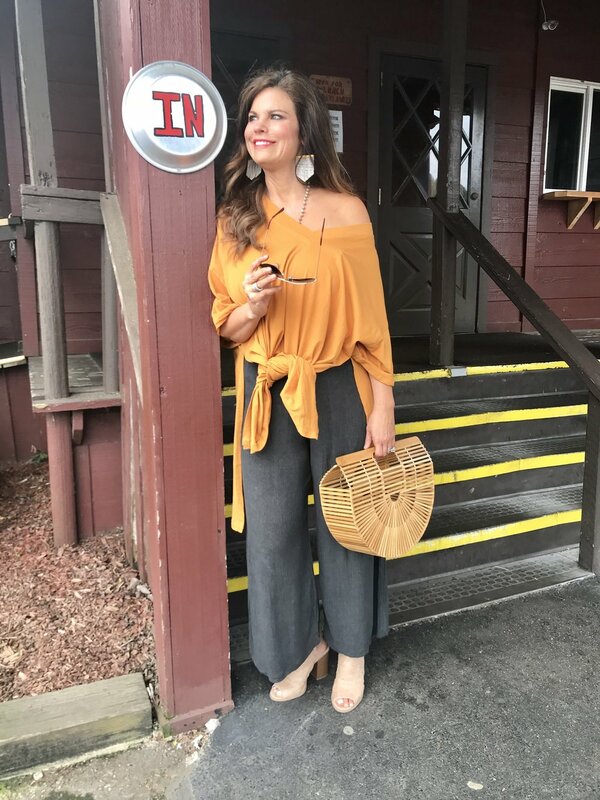 I wore Jennifer Thames jewelry with all three looks, She is a Mississippi designer and makes some fabulous pieces with such good price points. The store is full of great accessories. You will be greeted and appreciated for shopping here. I have often received handwritten thank you notes after shopping there. It is really refreshing. Social Jane is offering a 20% off one item if you tell her that you follow me. This discount is not good during the Good Friday sale or on top of any other discount. These items are in-store-only however they would be happy to ship. Follow them and shop them on Facebook and Instagram.